Click the New Registration tab on the top menu bar of the web page. Enter your official name (be careful in giving the name as appeared in your official record. This will automatically get entered in your application form. You cannot edit this name once submitted.) Enter a valid email id and mobile number (This will automatically get entered in your application form. You cannot edit these information once submitted). Upload your photograph as per the specification given on the web page. On submitting these details your username and password will be displayed. Note down the username and password which is required for the first login to your profile. If the notification demands Application Part B along with Part A the same can be downloaded from the link provide. The duly filled part B can be uploaded to the University website through the link available. 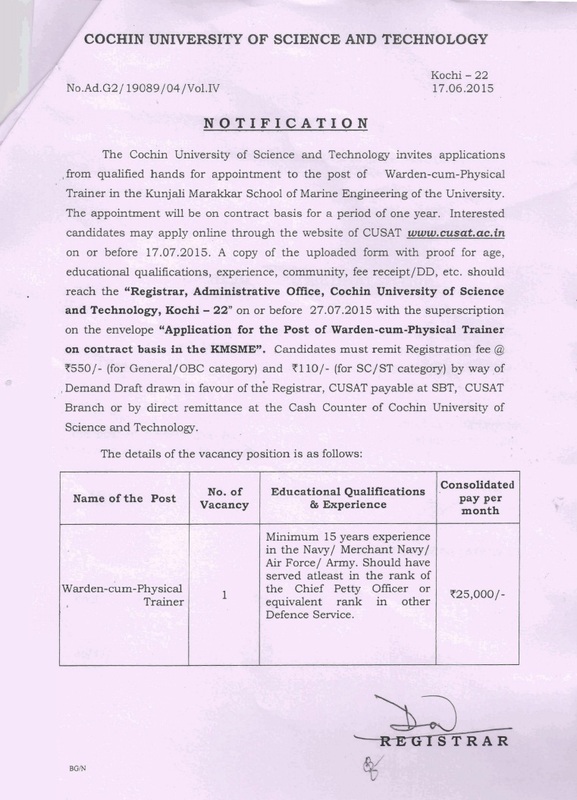 You can view the application form (Part A and Part B), by clicking the tab, View Application. Cross Check all the details for correctness and make sure that every entry made is recorded correctly. Finally enter the amount of Registration fee paid and DD No., date and Name of Bank and Branch / Cash receipt No, Book No (enter 000) and Date. Click on the Submit to University button (will be active only after entering the payment details and ticking a number of check boxes) for the final processing. The process of online submission will be over and your profile will be locked for further editing. Note down the Registration Number for further reference. 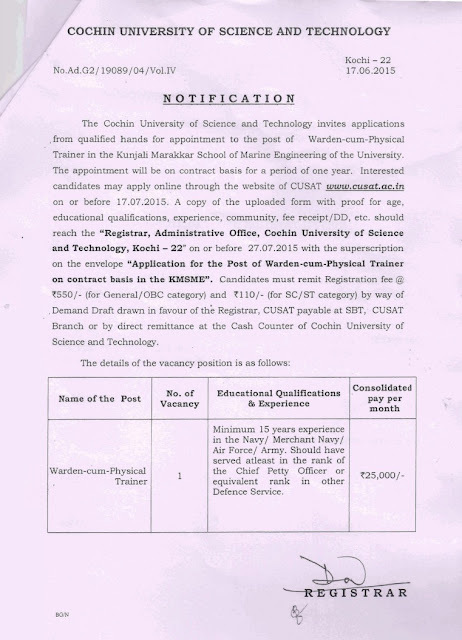 Forward sufficient copies of the printout of PART A and PART B (if instructed in the notification) of the application and other enclosures, to the Registrar, Cochin University of Science and Technology, Kochi 682022 so as to reach the University within the last date fixed for submission. After online submission you are able to view the profile, application etc. and take the printouts until the selection process is over.